This six hour tour is popular with clients that don't shy away from exercise on their vacations. The picturesque path to the glacier is a mixture of back-country and on-trail trekking and the view from the top of the 1400ft of elevation that we gain while traveling over 1.5 miles of trail is absolutely stunning. This trip usually spends between one and two hours on the ice exploring the best that Exit Glacier's undulating surface has to offer. Our 6 Hour Kenai Fjords National Park Cruise explores the world of whales, wildlife, and glaciers found in Kenai Fjords National Park. The Spirit of Adventure and Kenai Fjords 360 are two of our fastest catamarans, allowing you to experience as much scenery, glaciers, and wildlife as possible within six hours. Providing a full narration to your journey, a uniformed National Park Ranger will be onboard to point out the spectacular sights and provide information on the area’s ecology, history, and geology. You will spend time in front of the mighty Holgate Glacier, an actively calving tidewater glacier. This cruise is the best option for those traveling with same-day transportation packages from Anchorage. 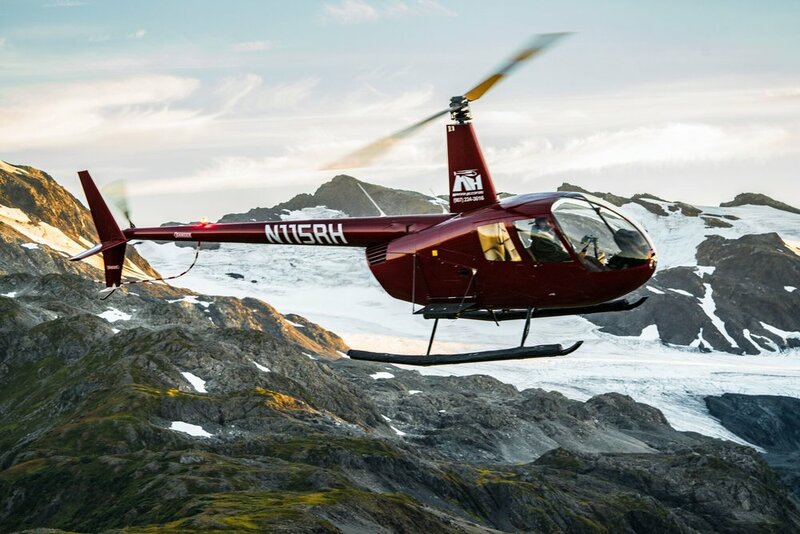 This is our most popular scenic tour, consisting of a full 30 minutes of flight time and highlighting the natural beauty of Kenai Fjords National Park's land and sea features. You'll begin your tour by flying over Resurrection Bay's brilliantly blue waters, home to a variety of Alaskan marine animals including seals, sea lions and even humpback whales! You'll follow the bay's dramatic, rocky coastline before turning up one of the many valleys in the area to search for wildlife and view impressive waterfalls, salmon filled streams and hanging glaciers. Emerging from the coastal mountains, your pilot will take you over an epic reveal of Bear Glacier Lagoon, filled with hundreds of icebergs-some as big as grocery stores! Here you'll zip around the icebergs and fly up Bear Glacier, the longest glacier off of the Harding Icefield at over 10 miles long and 2,000 feet think, before cruising through the aptly named Paradise Valley to look for goats and bear as you pass by even more hanging glaciers and melted, glacier pools. From there, you'll get a bird's eye view of Exit Glacier and then turn to follow the Resurrection River back to the airport. 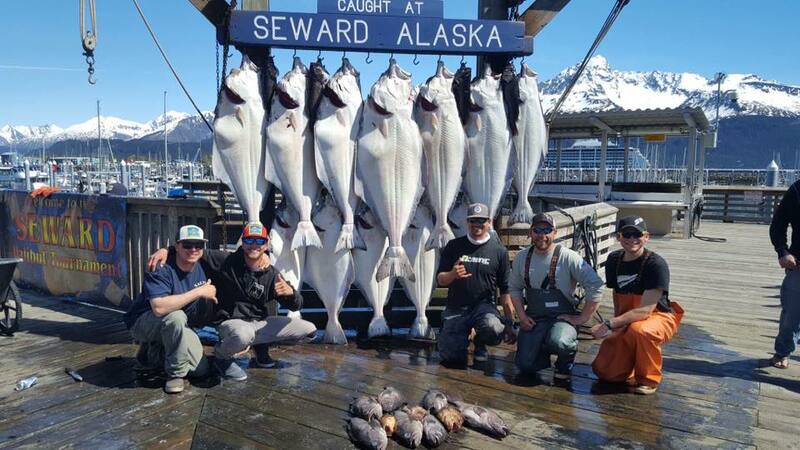 Seward’s abundance of wild fish species draw anglers to test their skills in the deep cold waters off of the Alaska’s coast. King Salmon (Chinook), Red Salmon (Sockeye) , Silver Salmon (Coho), Ling Cod, Rock Fish, and world famous Alaskan Halibut (Pacific Halibut) are just some of the species you can find in these water. You will be boarding your Halibut fishing charter in Sewards small boat harbor, then sit back and relax and enjoy the wildlife and scenery viewing experience as you commute to the fishing grounds. The captain and crew are all passionate fishermen and work hard to to put you right on top of the nicest fish that they can. Some of our guests have caught and eaten their wild Alaskan seafood all in the same day. Depending on what you were prefer done with your fish fillets, we can offer insider information on processing, packaging, and shipping right to your front door. This is a truly amazing opportunity. From the comfort of our kayaks, we'll explore the massive icebergs that are deposited by Bear Glacier, the Harding Icefield's largest glacier. You'll enjoy the stability of our boats in the glacier's calm lagoon while your group checks out the huge floating chunks of ice around you. The features in the lagoon change daily, and our guides' job is to expertly navigate your group safely though the maze of ice created by the calving glacier. The features in the lagoon change daily and your guide will choose the best route to navigate through the maze of ice. Wildlife also varies day to day with good chances to view harbor seals and black bears. This tour lasts a little over 5 hours and departs daily. Explore Alaska's temperate rain forest near Seward, Alaska, on our three-hour zipline canopy tour, featuring 8 ziplines, 3 suspension bridges and 2 rappels. Tour groups form up at the Welcome Center, meet their guides, outfitted with harnesses and helmets, instructed on proper zip line riding and braking technique, and put through practice “ground school” runs. Once completed they will be transported up a forest drive to a launch point near the top of the valley. Next comes a short walk to the course entrance and the first zip line leading to a platform with a panoramic view across the valley and glaciers to the southwest. At Alaska Surf Guides we offer remote Surfing & Stand Up Paddle Board (SUP) adventures to people looking to go beyond the cliche and experience Alaska’s truly hidden gems. Based out of Seward, Alaska, we use helicopters to access backcountry beaches for our 6 hour adventures. No board or wetsuit? No problem! We have a diverse quiver of Surf & Stand-up Paddle Boards available along with a fleet of wetsuits designed to keep you toasty, warm on the coldest days. Join us for the unique Alaskan adventure of a lifetime.